The first time I saw the paintings of William H. Johnson, they were works from his expressionist period, the first time he lived in Europe (1926-1929). Needless to say, it was one of those “holy cow!” moments, because I find those expressionist landscapes awesome! As an exhibiting/selling artist, he did not have a heck of a lot success, either in Europe or America. He had a challenging, emotionally turbulent life, rather like van Gogh did, and, like van Gogh, he seems to have expressed some of that intensity of feeling through the vibrant colors he used in his painting. Johnson was born in Florence, South Carolina. He discovered a love for drawing at an early age, but it was not until he was twenty that he could afford to start art training. He went to New York, which he considered to be the artistic center of the US. He learned the rigid, disciplined way of painting at the conservative National Academy of Design. Like many artists of the Harlem Renaissance, he worked on WPA mural projects from 1939 to 1943. Jitterbugs reflects the radical change Johnson adapted in his work during the late 1930s. After seeing Jacob Lawrence’s (1917-2000) Harlem scenes, Johnson abandoned the Soutine-type of Expressionism for one which reflected black life and culture. 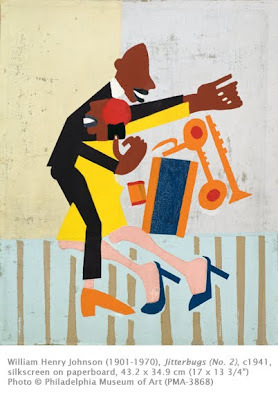 The emphasis on music, especially jazz, reflected Johnson’s pride in what he considered a uniquely African American art form. The simplified forms reflected Horace Pippin’s naïve paintings and Lawrence’s use of flattened shapes. The distorted space reflects the lingering European influences of Expressionism and Cubism. Johnson produced paintings of the Jitterbugs subjects and the subsequent prints after those paintings were widely popular. A nice retrospective of Johnson’s work that shows his progression from Expressionism to simplified abstract forms from the Smithsonian American Art Museum.